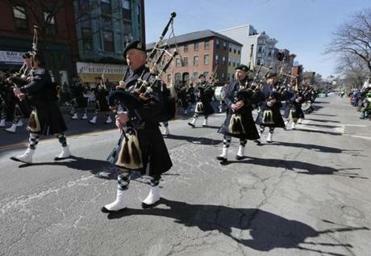 An organization representing the gay community announced Friday that it would march in the South Boston St. Patrick’s Day Parade on Sunday, a final sign that the storied event is ending its longstanding refusal to include gay groups. The decision by parade organizers to include Boston Pride, best known for holding its own parade in June celebrating lesbian, gay, bisexual, and transgender dignity, comes nearly 20 years after the US Supreme Court affirmed parade organizers’ right to exclude gay groups. It follows the organizers’ recent decision to allow a gay veterans group to march, prompting several local politicians to say they would drop their refusal to participate in the parade and join in as well. Parade coordinator Tim Duross said the Allied War Veterans Council, organizer of the 114-year-old parade, recently reviewed and voted on the application from Boston Pride as it would any other. The move to approve OUTVETS to march could be a significant development in the annual dispute over the inclusiveness of the event. Boston Mayor Martin J. Walsh, who last year tried unsuccessfully to negotiate the inclusion of a gay rights group, announced earlier this week he would become the first Boston mayor in two decades to march in the parade because organizers had embraced another group, OUTVETS, which honors LGBT veterans. Governor Charlie Baker, Suffolk County Sheriff Steven W. Tompkins, US Senator Edward J. Markey, and US Representative Seth Moulton also have announced plans to march. The parade has become a battleground for the gay rights movement in recent decades, after organizers sought to bar marchers from the Irish-American Gay, Lesbian, and Bisexual Group of Boston. The US Supreme Court ruled in 1995 that the march was a privately organized event protected by the First Amendment right to freedom of speech: organizers could include — or reject — any group. Organizers have argued that gay people have always marched. The prohibition, they contended, was not against the gay community but against political statements about sexual orientation or other issues. After Walsh’s negotiation efforts collapsed last year, gay marchers participated in at least two contingents, though they marched with South Boston community groups rather than as part of a gay rights organization. This year, after organizers accepted the application from OUTVETS, Boston Pride decided for the first time to apply to march, Bruni said. “We thought it was really important for us to step forward and say we want the whole LGBT community to be represented in the St. Patrick’s Day parade,” he said. Duross said some paradegoers might be offended by Boston Pride’s inclusion. But the group agreed to abide by rules that say all marchers must refrain from overt political messages or “any expression of sexual orientation,” Duross said. Duross said past controversies had cast an unfairly negative light on parade organizers. Bryan Bishop, cofounder of OUTVETS and chief of staff in the city of Boston’s Veterans Services Department, stressed that his group is apolitical and focused on supporting and recognizing the contributions of LGBT veterans. But, he said, he was pleased to hear the group called “a catalyst” in bringing progress. Moulton, who served four tours as a Marine in Iraq, announced Wednesday that he plans to march with OUTVETS. “Gay rights is the civil rights fight of our generation,” Moulton said in a statement. Markey also plans to march, he said Friday. Martin Finucane and Andrew Ryan of the Globe staff contributed to this report. Jeremy C. Fox can be reached at jeremy.fox@globe.com. Follow him on Twitter @JeremyCFox.